Homelessness - body, viral, An Eye Opener, Who Becomes Homeless? Homelessness is the condition of having no fixed, adequate, or secure place to live. In many, though not all cases, homelessness may be a result of mental illness, abuse, or addiction. Even when there is no associated mental health problem, those who are homeless may suffer emotionally because of the lack of the most basic of human needs: safe shelter. Jon and Ryan went for a bike ride one day and were astounded to discover a group of people living in cardboard boxes at the edge of the county park. Before this, it had never occurred to them that at the edges of their suburban community were people who lived on the streets, dependent on social service agencies, charities, friends, and their own ingenuity to find shelter. The number of people in the United States who are homeless is difficult to estimate because the population of homeless people is constantly changing as some people find housing and others are displaced. One 1999 estimate by the U.S. National Law Center on Homelessness and Poverty indicated that about 700,000 people were homeless on any given night and that over a one year period about 2 million people had experienced a period of homelessness. A study conducted in 1996 by the U.S. Census Bureau for the Department of Housing and Urban Development (HUD) showed that about 70 percent of people who are homeless can be found in cities, about 21 percent in suburbs, and about 9 percent in rural communities. Young people can become homeless too. Some teenagers become homeless with their families when financial problems force them from their homes. Other young people become homeless when they run away from home because of abuse, neglect, or indifference on the part of their families. The median age of runaway children is between 14 and 16 years. About 2.8 million young people living in U.S. households report that they ran away during the previous year. Approximately 300,000 people younger than 18 are homeless and on their own each year. Young people unaccompanied by parents account for about 3 percent of the homeless in cities. Homelessness can be either temporary, lasting only a few days or weeks, or semi-permanent, lasting for several years. The number of people who are without shelter is affected by many social factors, including the number of jobs available, the cost of housing, the cost of basic necessities such as food, and the availability of social outreach and assistance programs. Of the homeless people in the HUD study, about 15 percent were members of a homeless family and 85 percent were single adults. However, a 1998 study by the U.S. Conference of Mayors found that families made up 38 percent of the people experiencing homelessness, which suggests that the number of families without shelter is increasing. Seventy-seven percent of single adults who were homeless were men, whereas a woman headed the majority of homeless families (84 percent). In general, people are more likely to be homeless if they are between the ages of 25 and 54, have less than a high school education, belong to a racial minority, have a history of mental illness, and have experienced domestic violence or abuse. Other factors that increase the risk of becoming homeless include having lived in foster care or a group home as a child, childhood physical or sexual abuse, childhood experiences of homelessness, running away from home, and a history of drug or alcohol abuse. Most people who are homeless have no health insurance and little access to medical care. In the HUD study, almost half of homeless people surveyed had chronic (long-term) health problems such as diabetes * , cancer * , high blood pressure * , or arthritis * for which they were not receiving treatment. Another quarter of the homeless population had an infectious disease such as pneumonia * , tuberculosis * , or AIDS * . In addition, a very high proportion of people who are homeless have problems with drugs, alcohol, and/or mental illness. Almost none of these people receive treatment for their physical or emotional problems. Many people experiencing homelessness also become victims of crime while living on the streets. The most common programs available to help people who are homeless provide food (e.g., soup kitchens, food pantries) and emergency shelter. Although many people who are homeless are eligible for government programs such as Medicaid, food stamps, veterans' benefits, or welfare benefits, they often have difficulty claiming these benefits because they have no fixed address or lack the organizational skills necessary to follow through with these programs. Not all people experiencing homelessness are unemployed. In the HUD survey, 44 percent of those interviewed reported that they had done some paid work in the past month. Other sources of cash included gifts from friends and families, money collected panhandling, and money from illegal sources such as drug dealing and prostitution. * diabetes (dy-a-BEE-teez) is an impaired ability to control the levels of sugar in the blood because the body does not produce enough insulin or cannot use the insulin it makes normally. * cancer is a condition characterized by abnormal overgrowth of certain cells, which may be fatal. * pneumonia (noo-MO-nyah) is an inflammation of the lungs usually caused by a bacterial or viral infection. * AIDS is short for acquired immunodeficiency (im-yoo-no-de-FISH-un-see) syndrome, the disease caused by the human immunodeficiency virus (HIV).It is characterized by the profound weakening of the body's immune system. Reducing homelessness is the target of many social programs. Studies suggest that the most effective programs not only help people find places to live, but also help people solve the underlying problems that led to their homelessness in the first place. 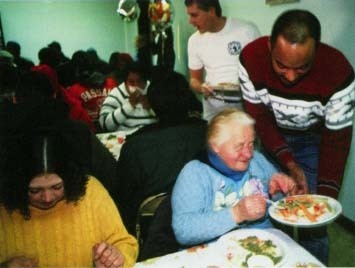 The Salvation Army, a Christian organization founded in London in 1878, provides food, shelter, and clothing for people needing aid, such as the homeless and the elderly. Their care has since spread throughout the United States, as well as other countries of the world. Eighner, Lars. Travels with Lizbeth: Three Years on the Road and on the Streets. New York: St. Martin's Press, 1993. The true story of a homeless person's survival on the streets with his dog, Lizbeth. Neufeld, John. Almost a Hero. New York: Simon and Schuster, 1995. A fictional story about a twelve-year-old's experience with homeless children. Bolnick, Jamie Pastor, and Tina S. Living at the Edge of the World: A Teenager's Survival in the Tunnels of Grand Central Station. New York: St. Martin's Press, 2000. The true story of Tina S., a runaway who survived a year of homelessness in New York and who now helps others who are without shelter. National Coalition for the Homeless, 1012 Fourteenth Street, NW, #600, Washington, D.C. 30005-3410. The National Coalition for the Homeless is a national advocacy network for homeless persons and providers of services to end homelessness. Among other services, the organization publishes fact sheets about homelessness and updates about legislation and government policies that affect the homeless.